"There is not one way of doing performance art, but many." PAS | Performance Art Studies was created by German artist and pedagogue BBB Johannes Deimling in January 2008 with the interest of establishing a platform for artistic and social dialogue in order to shape a space for constant, critical learning and exploration its inexhaustible potential between Performance Art and other art genres. The studies consist of gatherings of people, who are interested in sharing experiences, view points and visions in which collective, artistic experiments are made and widen the perspective and perception through participation and sharing. The process-based experiments are learning tools for sharpening ones view on the world and questioning our role as humans and creative workers. Since Performance Art constantly expands and develops, there remains a huge field of unknown and undiscovered territory, which could offer solutions for artistic and non-artistic research, production and reflection. Stating this means: the main learning tool within a PAS study is the process of which we are uncertain where it will lead us. This process is directed to all involved without restrictions and mainly guided by the agreed experiments. This openness towards the PAS process implies the logic that each and every one involved is using his or hers potential to sculpt the space in which we are learning, exploring and creating. 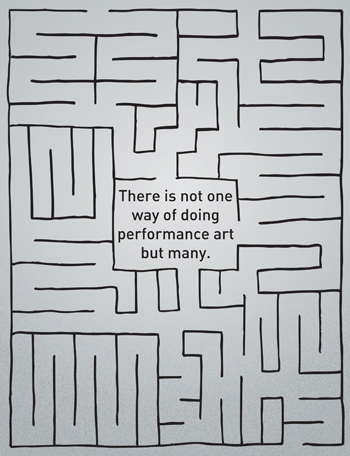 Aiming beyond the question ‘How do we create a performance art piece?’ is the soul of PAS process. The main source of a Performance work is the present body of a person who presents an artistic concept in front of a present audience in space and time. Therefore PAS understands Performance Art as a social art form and embraces diversity of those involved in its artistic processes. Skin color, age, gender, religion, political stance, social or cultural backgrounds are understood as qualities, and as tools to generate intersections where learning actually happens. The differences are treated equally and thought of as artistic formulas like color, shape, size, body, space, time, materials, which are the subjects of our artistic endeavors. This is essentially needed since the occurring intersections between humans, forms, opinions and artistic visions provide the potential to touch the unknown and create something that we would be unable to discover on our own. During this vivid process we constantly inspire, demand and challenge ourselves as a crucial deed for changing perspective and allowing content of others to be displayed. This, then could adapt or integrate within our working processes and attitudes. The collective learning pool has a very legible aim: the ‘I’ needs to transform into a unique readable sign, which addresses the other in order to start a dialogue. PAS consists of a dedicated and passionate team of educators and artists who support the idea that ‘there is not one way of doing Performance Art, but many’. Each PAS study features one or two guest teachers, who offer unique perspectives of the study topics and share previously made experiences. The PAS studies are collective learning pools, designed to explore, research and examine within the vast field of Art, especially Performance Art and connecting these outcomes to social, political and cultural issues. Each study suits a specific topic based on questions raised by historical and contemporary theories and practices. The choice of the study topic can also be influenced by the place and the context where PAS is happening. The process is directed toward the creation of an individual or collaborative performance, which is presented during a public event. Furthermore, it points to a deviation of former individual and collective working methods and structures. We are aiming to change how performance art has been produced and conceptualized over time. As with all mediums, Performance Art can find itself stuck in repetition of materials, attitudes and styles if learning focusses only on the historical and contemporary working methods. To avoid a hermetic learning process, we incorporate, whenever possible, other art forms (sculpture, painting, video, sound, photography, poetry, dance, architecture, theatre, activism, etc. ), as well as supporting theories from science, philosophy, politics and wide array of other fields. This inclusion model reaches beyond the status quo and helps to keep the process vivid and open. The PAS studies are mainly practical work sessions, in which performative experiments and questions are tested and shared amongst the participants. We use experiments, exercises, tasks, games, assignments and ‘homework’ to widen the pallet of perception, awareness and learning. Parallel, we offer direct reflections and analyses of made experiences. Discussions, feedback, storytelling, drawing, writing and documentation are constant companions of the practical work that are specifically selected to fit the research topic.